When you hit the hiking trail, sleeping is just as important as it is when you’re at home and just because you’re sleeping on the floor it doesn’t mean you can’t have a comfortable sleep. If your pillow isn’t comfy, then you might as well be sleeping on a rock, and you shouldn’t overlook how important a high-quality pillow is for ensuring that you get a restful sleep. If you’re camping, then you’ll no doubt be doing lots of physical activities that leave you feeling tired at the end of the day. This makes your sleep even more important than usual because your body needs to recover from this physical activity to ensure that you wake up in the morning feeling refreshed and ready to go. Camping pillows are often an afterthought, but we’ve created this guide to show you the best pillows for camping. It can be difficult to decide because of the huge choice ranging from luxury through to budget options. The Trekology camping pillow may be small in size, but it packs a punch when it comes to comfort. Its lightweight design means it can fold down to tiny size making it easy to transport while also being comfortable providing support to your head and neck. It simply inflates and deflates in seconds and weighs just 78 grams so you’ll barely feel it in your bag making it ideal for camping and hiking. To inflate you click a button and use 3-5 breaths and to deflate you use the quickly deflate mechanism. In terms of material, the pillow is constructed using highly durable elastic TPU fabric which is also water resistant. The ergonomic design also has a non-slip design which means that there is no danger of your head slipping or moving in the middle of the night. All these qualities make this our pick as the best camping pillow. Now if you’re looking for a premium camping pillow, then this certainly fits the bill. The Klymit luxe pillow is all about delivering high-quality comfort with its hybrid design. The pillow is compact but still provides excellent head support, so your head remains stable throughout the night. The outer 75D polyester material is soft, so you stay comfortable throughout the night. Because of its hybrid design, it means that it has adjustable height and pressure, so you add or release air to adjust. 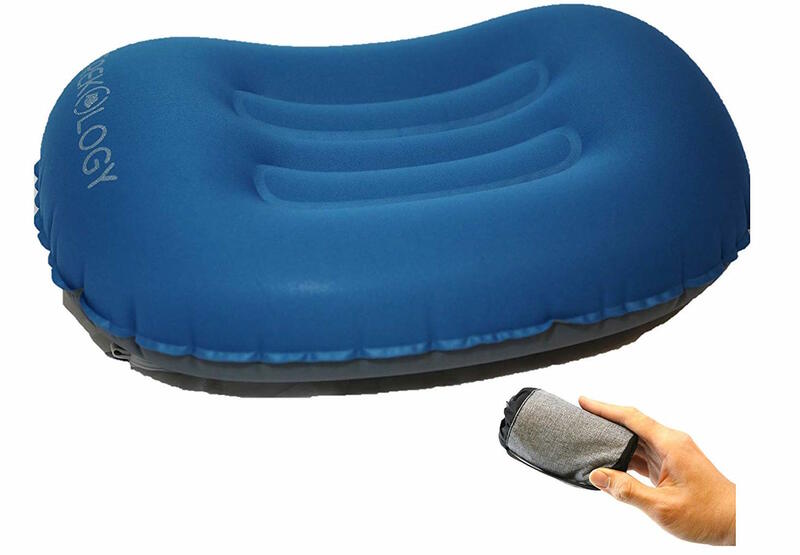 When fully deflated the pillow is extremely lightweight weighing only 6.2 ounces. A common complaint is that camping pillows are smaller than conventional pillows but due to its large inflated dimensions the Klymit luxe pillow almost the same size as your home pillow. 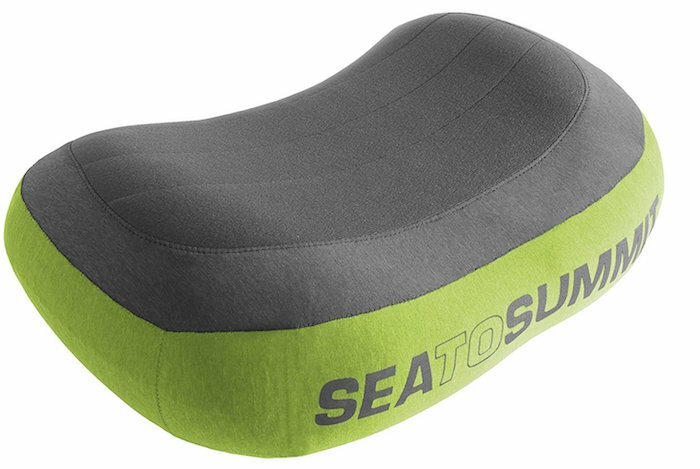 Weighing just 79 grams when deflated, the Sea to Summit Aeros premium pillow delivers great performance without the hindrance of weight. It makes it perfect for camping and travel. 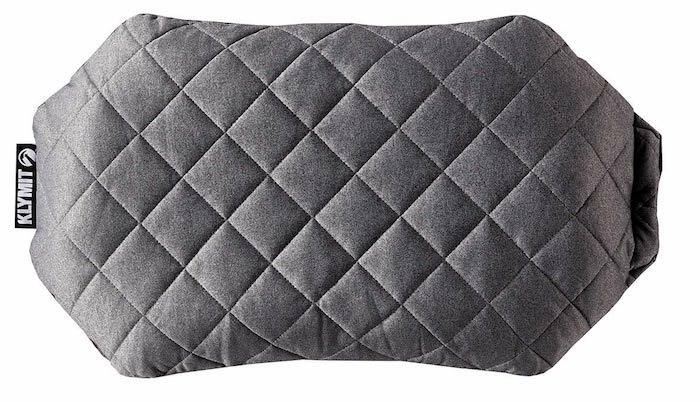 The pillow has a Brushed 50D polyester stretch knit face fabric for a soft hand feel and comfort while also have a high strength TPU bladder to ensure your head remains supported throughout the night and also wicking away perspiration, so you don’t overheat. The pillow contours your head with its curved internal baffles and is also easy to inflate and deflate with its patent-pending mini valve. Due to this being a premium pillow it is more expensive than the average camping pillow, but it does deliver superior support and comfort. 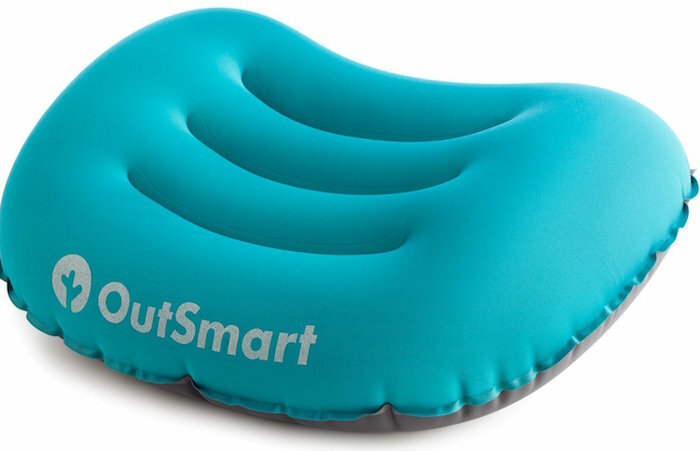 A camping pillow is a basic necessity for a camper, and the Outsmart inflatable camping pillow is an excellent addition to a camper’s gear. The pillow has elastic coated TPU fabric that not only maintains its shape but resists punctures. The pillow keeps your head well supported due to its ergonomic design to prevent neck pain or stiffness. This is despite weighing just 2.75 ounces making it one of the most lightweight inflatable pillows available on the market. Its matte surface is also non-slip while also being almost 19 cm in width which makes it a larger sized camping pillow. The pillow is easy to inflate allowing you to customise it to your desired firmness. The two-way valve also makes it easy to deflate. 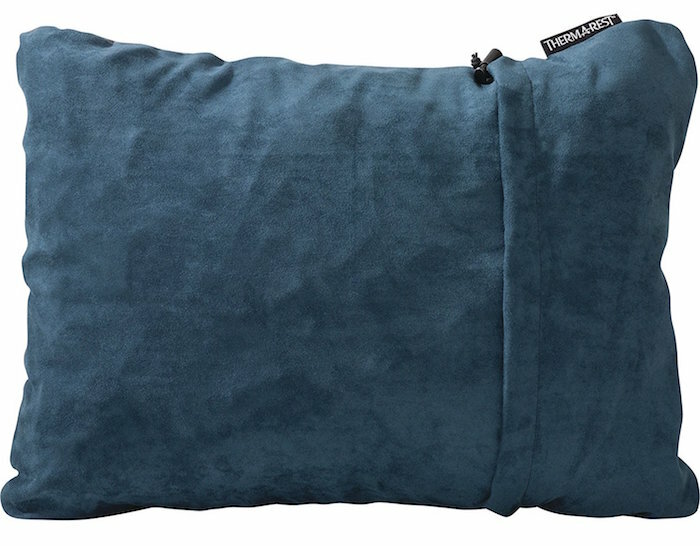 If you’re looking for the best compressible camping pillow, then the Therm-a-Rest Compressible Pillow is the ideal sleeping solution for you. The pillow weighs just 9 ounces making it ultralight that you won’t even notice it’s in your bag, however, doesn’t have the space minimising attributes that an inflating pillow has. The soft foam filling also allows you to compress it down when it’s not in use. When you’re ready to use, it expands into a 4-inch thick pillow supporting your neck, head and back. When it comes to comfort, it’s comparable to home sized pillows with its brushed polyester cover. When you’ve come home from an extended camping trip, the pillow is easy to maintain due to being machine washable. How is a camping pillow different to a regular pillow? The main difference between a camping pillow and a standard pillow is their size as they are small enough to make it easy to transport it. It's important because space is often limited when you’re going on hiking or camping trips. Some can be squished down to the height and width of a postcard and weigh just a few grams. The best camping pillows have gone through extensive testing that makes them more durable than normal pillows. If you bring your regular pillow camping, it deteriorates very fast because it’s not designed to be used outside in the wind and rain. Backpacking pillows also have additional features not present on normal pillows such as ergonomic shape, non-slip material and instant deflating technology with some features being specific to outdoor camping and activities. 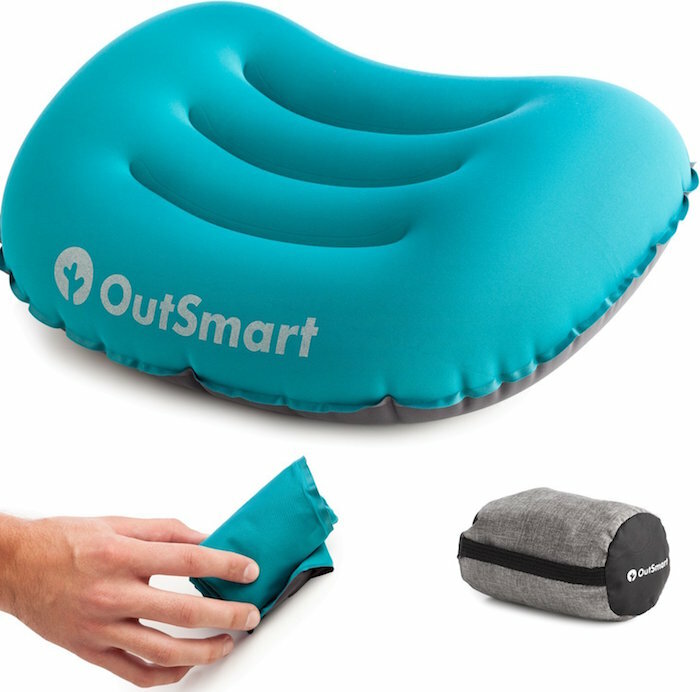 Inflatable camping pillows are the lightest option available, with some being self-inflating while others do require you to blow air into it to reach its full size. 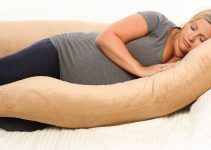 The main benefit of an inflatable pillow is that they and expand to a large size but also be deflated to a small size which makes it extremely portable. It makes it great for camping and travelling in general because it's lightweight weighing just a few grams. The main issue that inflatable pillows have is because they are made from minimal materials to make them light; this means that they don’t offer the same levels of comfort compared to other types. The higher quality inflatable pillows are made into ergonomic shapes to combat this, which cradles the head in a healthy comfortable position. You will notice the difference between an inflatable pillow and your traditional pillow at home. On the other end of the scale, you have compressible pillows which are closer to the type of pillow that you are used to using in your home. Compressible pillows look like standard pillows but slightly smaller in size. They are engineered to have revolutionary filings which make it more comfortable than many other types of pillow because you can also pack them down to be smaller in size. Although you will never be able to get them to compress to the same size as an inflatable version however they are significantly more comfortable, this makes the extra size a good trade-off because you’ll be getting higher quality sleep. Luckily if you desire the comfort of compressible pillows but want the portability of an inflatable pillow, then you can also choose a hybrid camping pillow. These usually have a top layer which is compressible but also have an inflatable bottom side which provides comfort and support to your head. Hybrid pillows will vary for different manufacturers depending on the type of fabric and filings that they use. The more convenient hybrid pillows have a removable cover which makes it easier to wash especially if you’re camping in the wilderness. The size of your pillow isn’t just important when you’re transporting it but also when you’re using it. You need to ensure that your pillow is big enough for your head to fit on it with hanging off the edge comfortably. If it isn’t big enough to support your head, then you won’t be comfortable, and this will result in you not getting much sleep. Not only can this lead to you feeling tired in the morning but also give you neck pain. Just like your pillow at home, your camping pillow needs to match your sleeping style. It ensures that your spine maintains alignment which will give you a more restful sleep. If you’re a stomach sleeper, then you don’t need a pillow to keep your back completely aligned. However back sleepers require slightly thinner pillows, and if you’re a side sleeper, then you need a slightly thicker pillow so as you can see there is a difference in needs depending on your sleeping position. Regardless of the position you sleep in, you need to ensure that your chosen pillow cradles your head effectively while also being thick enough to support your neck. When you’re going camping you need to be aware of the weight of every bit of equipment that you’re taking. Most of your gear may not individually weight a lot, but collectively it can create a heavy load. If you’re planning on taking your pillow in your backpack, then you’ll want to ensure that it’s light whereas if you’re in a caravan or car, the weight won’t be so much a consideration. If this is the case, then you have the opportunity of buying a higher quality luxury option. For your standard pillow at home compressibility is probably something you don’t think about, but for a camping pillow, this is very important especially if you're going to be out hiking carrying a lot of equipment. Compressibility is an important consideration to ensure that you will be able to fit all your gear into your bag. Picking a pillow that has high compressibility means that the pillow will fit down into a small space when it’s not being used freeing up room for other items. If you’re only going to be transporting it in your car, then this isn’t going to be an issue. Like any consumer good, there is the change that a defect will develop rendering it faulty. 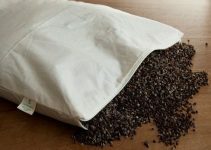 It’s important to be aware of the camping pillow you buy is supplied with a warranty which will give you extra protection if something goes wrong. Warranty lengths will vary by manufacturer anywhere from 30 days to lifetime. The length of the warranty is usually longer for the higher quality pillow and more reputable manufacturers who stand by their product. You also need to check the details of the warranty to check what it exactly covers as it’s unlikely that it will cover general wear and tear due to it being an outdoor camping product. Durability will be a factor depending on your intended use of the pillow. If you’re planning to use it in your car every now and again, then it’s probably something you don’t need to think about. If you’re planning on taking your pillow travelling or camping, then you need to ensure that your pillow is made of higher quality durable materials which make it built to last. For instance, a lower quality inflatable model has a more significant chance of being punctured or damaged which is the last thing you want on the first night of your week away camping. 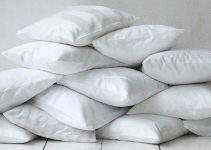 The washing method of your chosen pillow will depend on the type and brand of pillow that you purchase. Some will allow you to machine wash whereas others will need to be hand washed. If hand washing is not for you, then be sure to check whether your desired pillow is suitable for machine washing.